Hume’s Warbler (Phylloscopus humei): One of the commonest leaf warblers, it has an overall dull colour with greenish upperparts and off-white underparts. Other features include a long supercilium, weak/absent crown-stripe, prominently pale tertial edges, no white margins to the tail, one prominent pale wing bar (just a faint vestige of the second wing bar may be visible). The darker legs and lower mandibles are diagnostic. Hume’s is among the smaller of leaf warblers; it breeds near the tree-line and is partial to birch forests in the summer. In the winter it is one of the commonest species found all over the plains of North India. It’s solitary in winter and calls incessantly from the crowns of trees. Call: A repeated, disyllabic ringing tiss-yip, buzzy wheezing tzzzeeeeeu, often given interspersed with calls. Greenish Warbler (Phylloscopus trochiloides): A common winter migrant in peninsular India, it is one of the larger leaf warblers. It has greyish-green upper parts and off-white underparts. Absence of coronal stripe, yellowish-white supercilium and a single wing bar are other features which help distinguish this species. During the breeding season, Greenish Warbler occurs close to the tree-line in mixed-conifer forests and rhododendrons. In winter, it is territorial and partial to the canopy, from the top of which it calls incessantly to defend its precious territory. Call: a disyllabic tisswit or chiswee. Lemon-rumped Warbler (Phylloscopus chloronotus): This tiny little leaf warbler gets its name from its pale yellowish rump which is frequently exposed as it hovers at the edge of leaves to pick arthropod prey. It’s a rather active bird with olive green upperparts, whitish underparts, dark bill and pale legs. The head is rather distinctive with a prominent pale yellow crown stripe, a broad yellowish supercilium and a very dark eye-stripe which broadens behind the eye and hooks under the ear coverts. Typically two yellowish wing bars are visible, the lower one being larger and more prominent. This species is an altitudinal migrant, spending the summer in the mixed coniferous, oak and rhododendron forests and retreating to the foothills in winter where it joins mixed-species flocks to forage mostly in the mid-canopy and undergrowth. More than two may be part of the same flock, daintily hovering around the vegetation and is an absolute treat to watch! Call: A high-pitched tsip or uist. Apart from the above there are a number of other species of Phylloscopus warbler that can be observed in the Indian subcontinent. Most of these species migrate over long distances to winter in the Indian plains and peninsular India, some show an altitudinal migration, and a couple of them are resident throughout the year. Here is a very handy key for their visual identification compiled by Umesh Srinivasan. This concludes our three-part series on Phylloscopus warblers. 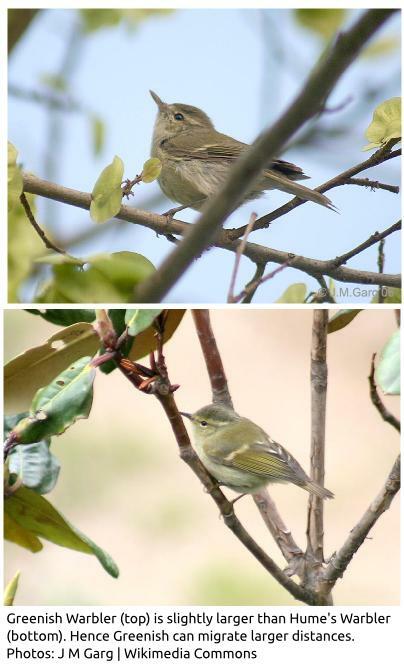 We hope that these articles helped you in identifying the main species in this difficult group and also provided interesting information about the ecology of leaf warblers. We’d like to know if you liked this series and if you’d like us to run more such articles in the future on the MigrantWatch blog. Please do send in your comments and feedback at mw@migrantwatch.in. You can read Part I and Part II in this series of articles on leaf warblers. 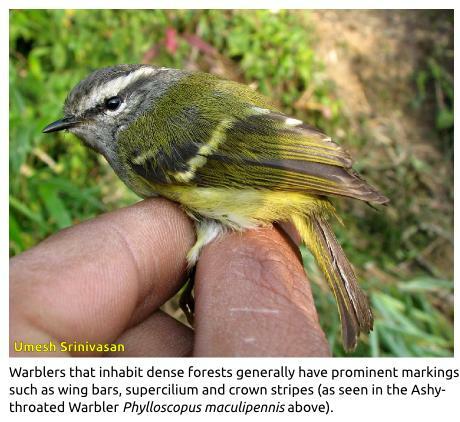 To most of us, Phylloscopus leaf warblers belong to just one size category: tiny! And confusing. Every winter, these diminutive and inconspicuous birds envelope the subcontinent in a wave, migrating thousands of kilometres south from their breeding grounds in the Himalayas and beyond. 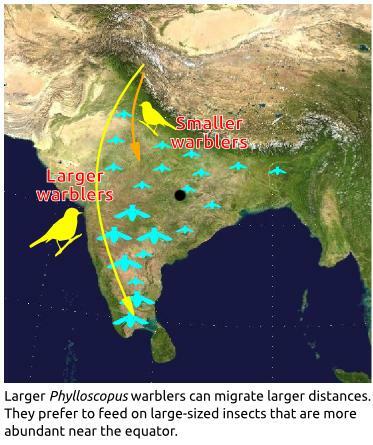 Migrating long distances takes a lot of energy, particularly for smaller species. Small differences in body weights among species make a huge difference in deciding how far they have to travel for wintering. Small-sized warblers are geared to feed on small insects, which are available in good quantities right from the Himalayan foothills all the way down south. 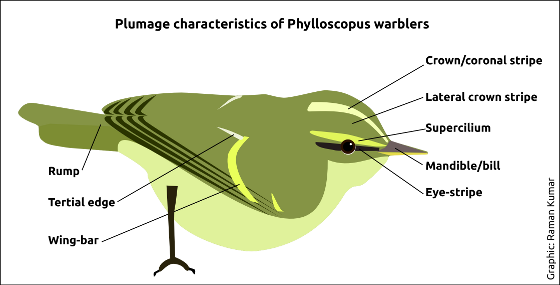 The larger Phylloscopus warblers (like Large-billed, Greenish, and Western-crowned) do not have it so easy, as their preferred food – large insects – are available in adequate supply only further south. Hence, in the wintering season smaller species don’t travel very far, with their southern limit being either the sub-Himalayan foothills (e.g. Lemon-rumped Warbler) or mostly up to Central India (e.g. Hume’s Warbler), where wintering ranges of larger species begin. In contrast, larger species (e.g. Greenish and Western Crowned Warblers) travel farther south and all way to southern India and Sri Lanka. A great deal of knowledge about the wintering ecology of Greenish Warblers has emerged from Madhusudan Katti’s work in the Kalakkad-Mundanthurai forests of Tamil Nadu. He found that individual birds, quite remarkably, come back to the same wintering territory year after year! Also, in years of scanty rainfall and limited food the birds were unable to eat enough to moult in time for their long journey back to their breeding sites. This shows how conditions in their wintering habitats may influence whether birds are able to make it back to breed; and this has obvious implications for the size of the population. Several parallels exist between the way these birds breed and winter. For example, the species which breed on “top of the mountains” (Hume’s and Greenish Warblers) spend the winter on “top of the trees”. Interestingly, while these two species are territorial in winter (both males and females defend territories), others, like the Western-crowned and Lemon-rumped Warblers, join mixed-species flocks. Although most species spend their breeding and wintering seasons in drastically different forests, they use similar foraging techniques. For instance, the Lemon-rumped Warbler (which breeds in conifer-mixed forests and winters in sal forests), mostly captures prey by hovering in the outer foliage of trees in both seasons. The Himalayas, because they provide such a huge variety of habitats, harbour one of the richest communities of leaf warbler species in the world. Twenty-one out of the world’s 61 species of Phylloscopus are found in the Himalayan region. They occupy the entire range of habitats from tropical evergreen/deciduous forests in the foothills to the alpine meadows above the treeline. In the Himalayas the elevation zone 2500–3000 m supports the highest diversity of breeding warblers, where up to 9 species may breed together. How do so many similar species coexist in one place? One reason is that while superficially leaf warblers are very similar, different species possess differently sized body parts. This is associated with differences in foraging behaviour. For instance, larger species eat larger insects and species with wider beaks catch more flying insects. Another way to allow coexistence is by occupying different elevation zones. To avoid competing for similar food using similar methods, each altitudinal zone in the mountain typically has one large species, a medium species and a small species, which capitalize on prey in accordance to their body sizes. 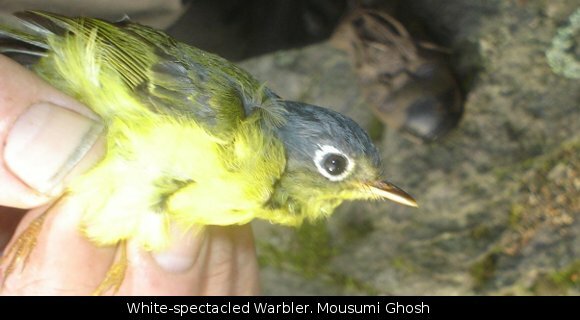 The overall drab colours of leaf warblers conceal subtle differences which not only indicate the habitat that they breed in, but also help in communicating and selecting mates. To the trained eye, visually distinguishing most of the leaf warblers involves relying on presence, number and colour of brighter patches such as wing bars, supercilium, rump patch and crown stripes. Species occurring in dense habitats, such as the Lemon-rumped Warbler, typically possess many bright patches (two wing bars, a distinct supercilium, crown stripe and rump patch). Such warblers often flash these patches to communicate. Additionally, males with brighter and longer wing bars are of higher quality (such males occupy larger territories) and are preferred by females. On the other hand, the Tickell’s Warbler, which breeds in open Juniper scrub, has no bright patches at all. When I started birding seriously in the year 2005 after joining the Master’s course at the Wildlife Institute of India, I conveniently ignored every warbler I saw. Since visual identification was very difficult (given their frustratingly similar and drab appearances), I was happy enough to say that so-and-so bird was of a warblerish persuasion, and leave it at that. 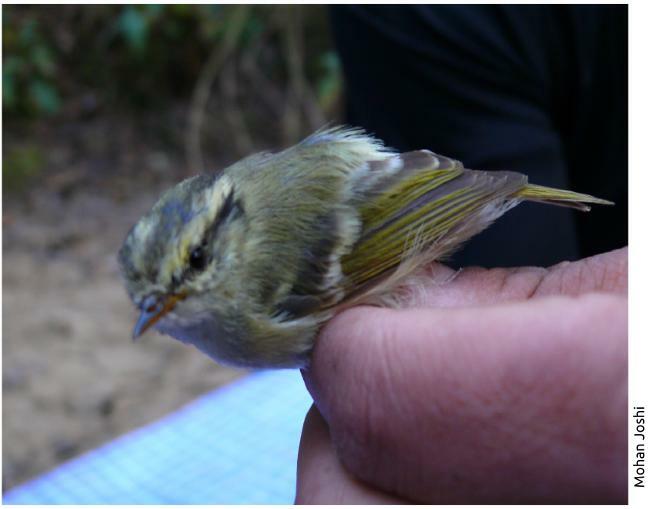 But then, as fate would have it, I wound up studying the wintering ecology of three species of leaf warblers in the Himalayan foothill forests of Himachal Pradesh for my MSc dissertation. While my primary motivation was to understand how they survive the winter sharing dwindling food resources, I now had to identify them accurately for my work to make any sense. In most situations a bird in hand is worth two in the bush, but when it comes to identifying leaf warblers it is better to have a bird singing in the bushes than have even ten in your hand! This wisdom came to me from my supervisors Mr. Pratap Singh and Dr. Dhananjai Mohan, who taught me how to identify leaf warblers in the field from their calls and song. These remarkable little birds belong to the family Phylloscopidae, whose members are dressed in various hues of dull green, yellow, grey and occasionally bright chestnut (as in the Chestnut-crowned Warbler). They are among the commonest species of European and Asian forests. The word Phylloscopus literally means ‘looking into the leaves’ and this aptly describes our industrious friends, who spend almost 75% of their waking hours searching for insects among the leaves. The genus is famed for its astounding diversity: more than 60 species of Phylloscopus are described. Most of them breed in the temperate areas of Europe and Asia. 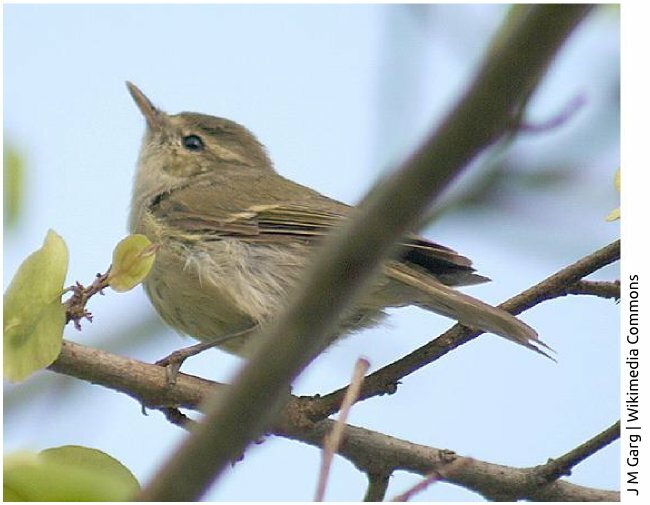 Despite weighing only 5-10g, some leaf warblers migrate over thousands of kilometres to arrive in their wintering quarters in the tropics of Africa and South Asia, including the Indian subcontinent. To cite an example, Hume’s Warbler (weighing just about 6 g) covers almost as much distance as the celebrated Siberian Crane (weighing 6 kg) to reach the plains of India from where it breeds in Siberia! The same attributes which make them so difficult to identify (so many species, yet so similar in appearance) have made them one of the most well-studied groups of birds in the world. 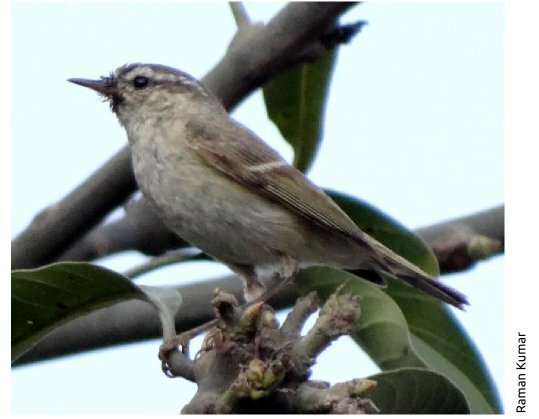 Within India, detailed studies of their breeding (in the Himalayas) and wintering ecology (Himalayan foothills, peninsular India) by Dr. Trevor Price and his students have revealed a great deal about these leaf warblers in both breeding and wintering seasons. Dr R. Jayapal is an assistant professor at the School of Human Ecology, Ambedkar University, Delhi. Essentially a birdwatcher trained in wildlife ecology and conservation, he has been doing ecological research on birds for more than 15 years, and has worked in various landscapes across India ranging from the Central Indian Highlands of Madhya Pradesh to the trans-Himalayas of Ladakh. Until the 1990s, life used to be simple and straightforward for a serious warbler-watcher in the Subcontinent. One would know this was a Chiffchaff and that was a Booted Warbler. Although both had two subspecies wintering in our region, one normally wouldn’t bother about that as all the literature would say it was nearly impossible to identify them unless in hand. I also suspect that just identifying them authoritatively as a Chiffchaff or a Booted Warbler in the field was esoteric enough to impress and awe others. But things changed with the increased use of DNA to lump or separate species, supported by analysis of vocalizations in the field. These developments have both advanced the science of taxonomy and jolted us good old birdwatchers and subverted our long-cherished complacency. The Chiffchaff has been split into Common Chiffchaff and Mountain Chiffchaff (actually more, but that’s another story) and the erstwhile Booted Warbler has been found to consist of two species – Sykes’s Warbler (Hippolais rama) and Booted Warbler (Hippolais caligata). [They were initially treated so in 19th century, but then that was before the era of trinomial nomenclature]. Now to the mundane, but yet the most pertinent question –– is it possible to differentiate these two Hippolais warblers in the field? The answer is Yes and No… Yes, if you are careful to note down some subtle yet distinct field-characters and fortunate to observe the birds in fresh plumage closely. No, if you are a birder like me who does not have those discerning pair of eyes and who has this inexplicable habit of always encountering birds in worn plumage or moult, or worse, individuals showing intermediate characters (Apparently, they do hybridize). 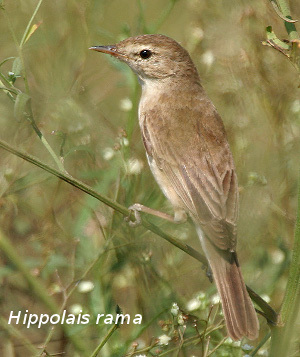 To begin with, a birder is more likely to come across two types of Hippolais warblers: one that looks like a reed-warbler (Acrocephalus) but behaves typically like a leaf-warbler (Phylloscopus), and another the other way round. If this peculiarity strikes you in the field, well, half the battle is won. [Warning: Judging a bird as a look-alike or behave-alike can become subjective]. Sykes’s Warbler (H. rama), with a longer bill and a longer, graduated (i.e., narrowing in steps) tail, looks strikingly (!) like an Acrocephalus reed-warbler. It also has a relatively longish body (from bill to tail tip) that is accentuated by somewhat longer under tail-coverts. But, despite its reed-warbler-like appearance, its foraging behaviour is strangely reminiscent of a Phylloscopus leaf-warbler. You can see it actively gleaning and flycatching in the middle- and top canopy of tall shrubs and low trees, rarely descending down to ground-level vegetation. Both the Hippolais often twitch and flick open their tails, and while doing so, rama’s graduated tail feathers are hard to miss. Other diagnostic characters of rama may be either difficult to observe in the field or may not always be conspicuously present in all the individuals. These include: a completely pale yellow lower bill lacking any dark-tip, absence of darker margin to the short white supercilium (just above the lores), and pinkish-brown legs (which are slightly darker compared to caligata’s pale yellow tarsus). Booted Warbler (H. caligata) has a comparatively shorter bill and a squarish, shorter-looking tail with an abruptly-ending belly (owing to much shorter under tail-coverts). These features make the bird look rather like a Phylloscopus leaf-warbler. H. caligata distinctly lacks the proportionately long body plan of rama. When the tail is twitched open, the Phylloscopus-like squarer tail feathers are quite unmistakable (contra rama). 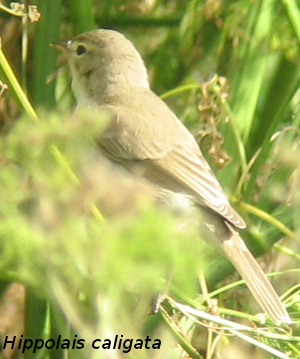 The Booted Warbler invariably forages like an Acrocephalus reed-warbler among the undergrowth and herbage at the ground-level (though more tame than many Acrocephalus). It does, however, occasionally visit the middle canopy only to return to lower vegetation in a moment or so. As described under rama, there are other diagnostic characters of caligata that may not always be useful in the field. These include a dark-tipped pale lower-bill, a dark supra-ocular margin just above the lores (present only in fresh plumage), and paler looking legs. It is important to note that both rama and caligata have almost indistinguishable calls in their winter quarters – a hard and dry chuk. And it should be remembered here that NOT ALL individuals are identifiable with certainty in the field, as individuals with intermediate characters are ‘not uncommon’ (ah, what a wonderful phrase!). 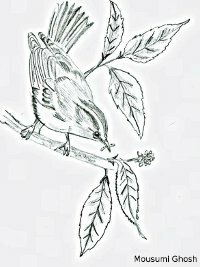 There have also been recent revisions in the taxonomy of Family Acrocephalidae resulting in placement of both these Hippolais taxa in the genus Iduna along with Thick-billed Warbler. One should also keep in mind that the wintering ranges of both rama and caligata have not been completely worked out as all our current understanding is based on museum collections and subspecies identity was not possible in a majority of past sight records (For more information, see P.C. Rasmussen & J.C. Anderton, 2005. Birds of South Asia: The Ripley Guide. Smithsonian Institution, Washington DC & Lynx Edicions, Barcelona). For all practical purposes, both taxa are likely to occur in most parts of the Subcontinent (probably except the higher Himalayas and north-eastern hills) either as winter visitors or passage migrants. If you do find these tips helpful (or hopeless) in the field, please do write to me as that would greatly reassure me (that I am not alone).